Ovariectomized female mice develop glucose intolerance. Plasma glucose levels during OGTT (2 g/kg) (A) and the related AUCs (B) in sham (gray bars, n = 12) and ovx (white bars, n = 13) mice, 1 week after the surgery. 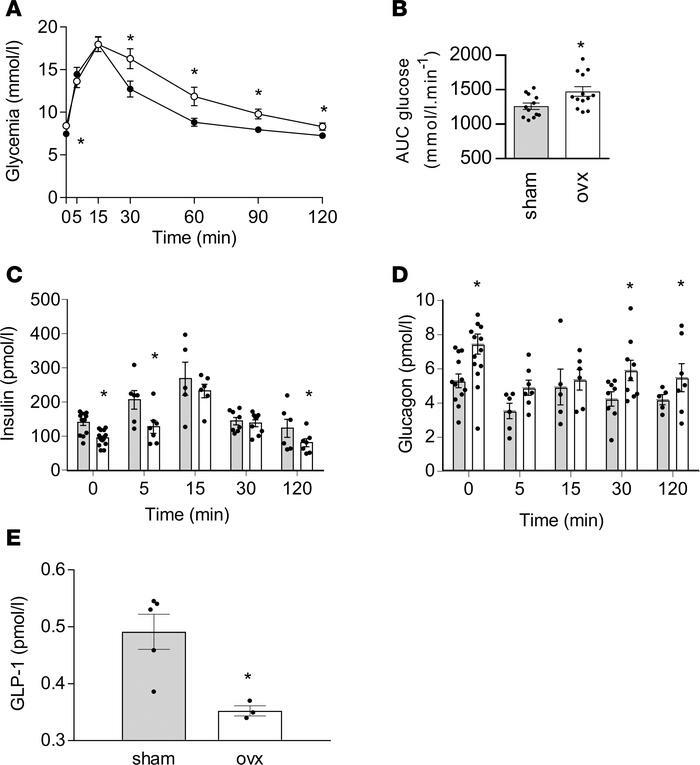 Plasma insulin (C), glucagon (n = 6 at least per group) (D), and GLP-1 levels 5 minutes after gavage (sham, n = 5; ovx, n = 3) (E) during the OGTT. One-way repeated ANOVA with Bonferonni post hoc test analyses were performed for glycemia (A), and 2-tailed Student’s t test statistical analyses were performed for the other results. *P ≤ 0.05 for sham vs. ovx mice.